Katsumata Gym, one of our favourite promotional outfits appear to have done it again with a stand out card to see out the month of September. The show, a 7 fight card at the Korakuen Hall is dubbed "Fil-Japan Vol. III" and features not only the third professional bout of Tomomi Tokano, but also recognisable names such as Ryan Bito, Yuki Chinen and an excellent main event which pits the unbeaten Masayuki Ito against the once beaten Jeffrey Arienza for the WBC Youth Lightweight title. The poster might not be anything special but the card it's self is genuinely a very solid one. 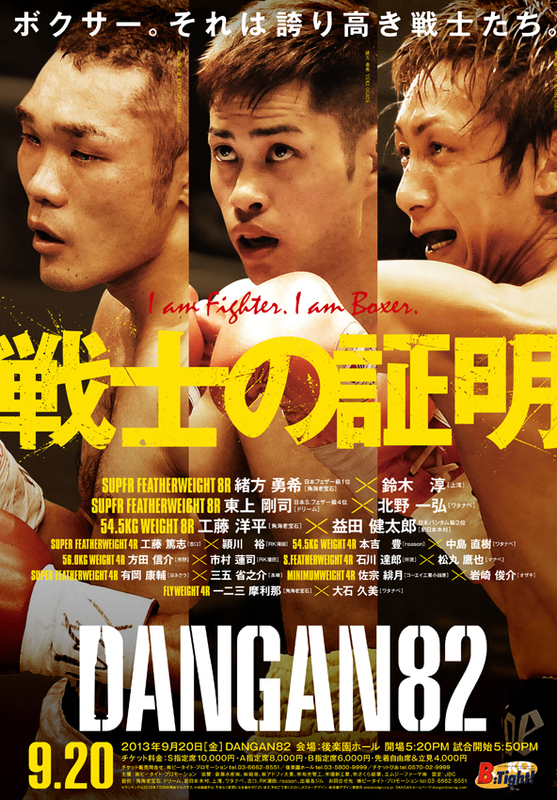 Dangan Boxing Promotions put on their next show on September 20th with the originally named "Dangan 82". The show, at the Korakuen Hall, features 10 bouts with a triple-header main event featuring Yuki Ogata, Kentaro Masuda and Tsuyoshi Tojo, all 3 of whom are ranked in the JBC top 5 of their respective divisions. Although the poster isn't amazing, it's nice to see the top 3 names on the card sharing the poster space which also contains a lot of information spread across it.